Leukemia is a very aggressive blood cancer that affects close to 45,000 people each year, including thousands of children. September is Leukemia Awareness Month, and organizations and groups around the country organize events to help raise awareness of this dangerous disease. 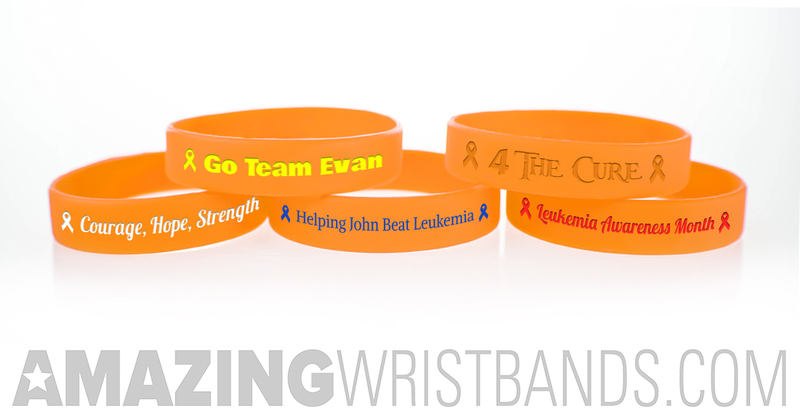 Leukemia wristbands can help with many different types of fundraising and awareness campaigns. Orange has become known as the recognized awareness color for leukemia. 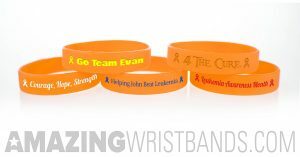 When you shop with AmazingWristbands.com, you can use our online customizer to create personalized leukemia wristbands. If your bands will be used for a large event, choose a general message, such as "Support Leukemia Awareness". Or, if you're creating custom bracelets for a specific person fighting leukemia, then you may want to use their name on your bands, such as "Go Team Daniel - Beat Leukemia!" Inspirational messages such as "Faith - Love - Hope" are also popular for leukemia wristbands. According to Leukemia Lymphoma Society, symptoms of leukemia are common to other, less serious illnesses. This can make diagnosing leukemia early a challenge. Common symptoms include, fatigue, headaches, excessive bruising, joint pain, and overall achiness. Overall, leukemia has a survival rate of around 60%, with wide variations based on the specific sub-type. Some forms of leukemia have no effective treatment and no chance for a cure. At AmazingWristbands.com, we sell only 100% silicone that are non-allergenic and latex free. Many of our wristbands have no minimums and can be delivered within a few days. Use our online builder to create your wristband, or give us a call if you need help. We offer free shipping, free artwork, free design, and free color matching. Create your custom leukemia wristbands today!